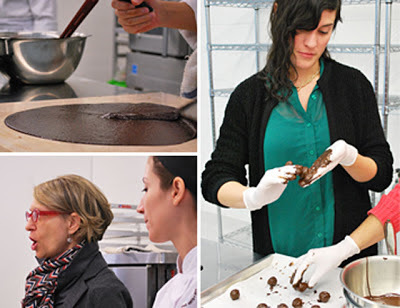 When you get the chance to go on a culinary date with some rich, hot piece of French... chocolate, you can spend hours imagining where the two of you might go together: for a dip in a pool of ganache; for a spin in an ice cream maker; to an intimate gathering in the creamy middle of a flourless chocolate cake. Recently, I had the opportunity to attend a chocolate class hosted by Cacao Barry at the new location of the Bonnie Gordon College of Confectionery Arts. The class centred on the proper tempering techniques when working with couverture chocolate (the chocolate pieces used in baking and candy making). I discovered that chocolate, like any amorous relationship, requires specific temperatures, much patience, and careful tending to elicit the appropriate response (or a delightfully inappropriate response). 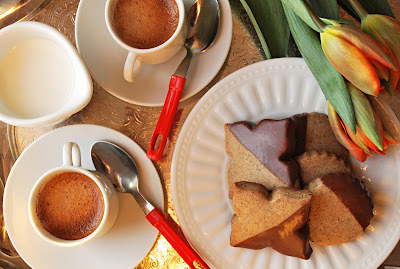 In order to find out whether or not the Saint Dominique chocolate is boasting on that account, or simply being flirtatious, I decided to take it on a dessert date - to get intimate with some buttery, espresso-speckled shortbread. ... The verdict? The chocolate flavour lingered decadently, but malheureusement the shortbread didn't last long at all. A College of Confectionery Arts sounds like someplace the more gastronomically inclined students at Hogwarts might attend for post-secondary education. 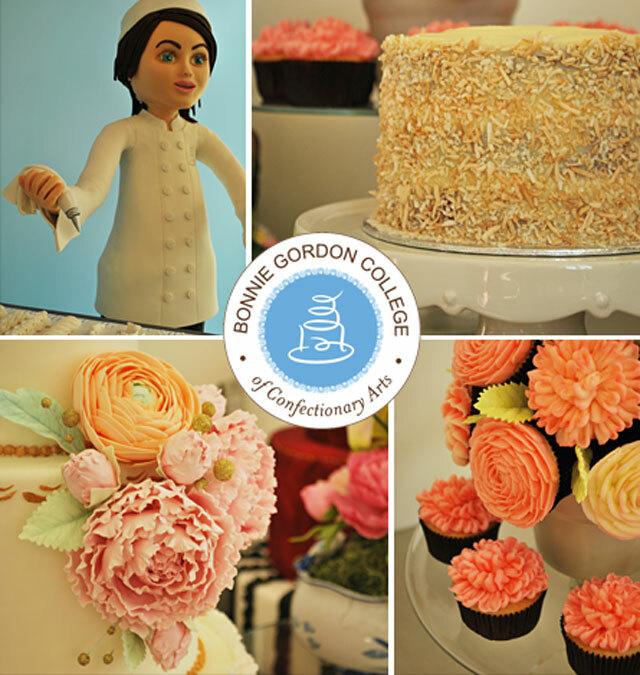 Bonnie Gordon is certainly a wizard with cakes and pastry. She has a knack for instilling her particular brand of magic into the creative expressions of her white-coat-clad culinary wizards-in-training. The cakes we got to see on our tour of the brand-new facilities were pieces of art in themselves. Topped with life-like flowers, they merited a second glance due to a moment of disbelief that sugar gumpaste (and much patience) are capable of reproducing such realistic beauty. Bonnie herself (she's the one in the stylish red glasses, below) lead a group of us around the new space, which boasts three large professional kitchens, a multi-purpose demonstration room and enough stainless steel counter space to make those with tiny kitchens swoon. The equipment at the school is top-notch and ranges from the most basic of tools to high-tech innovation. There is everything from a simple slender paintbrush for fondant detailing to a hot plate with so many options and advanced settings it requires a PhD to operate it. 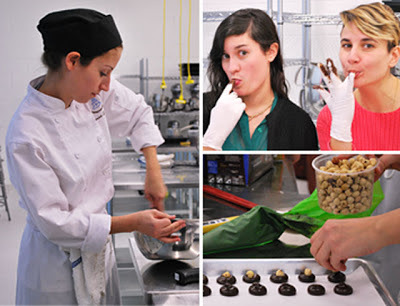 We split into small groups and rather enjoyed the (ahem) hands-on approach of rolling and glazing our hazelnut truffles. My culinary kindred spirits for the afternoon were @TamaraJunkin from Junkin Says and Good Food Revolution, @Lisaahh from She Does the City, and @torviewtor from Torview Toronto. It was a pleasure to spend the afternoon elbow-deep in chocolate with these ladies and I was on a high as I made my way home that day. 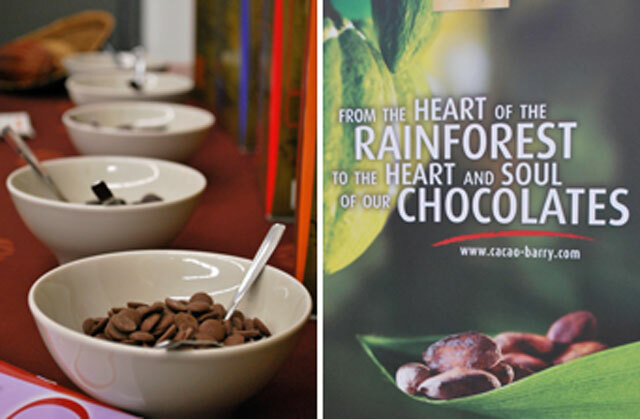 Part of it was the company, part of it was the amount of chocolate I 'sampled', and part of it had to do with the two packages of premium Cacao Barry chocolate I now held companionably in each arm. After much careful deliberation, I decided the deep, dark notes of the 70% would work superbly with espresso as an accompanying flavour - and that shortbread was the ideal matchmaker to bring the two together. 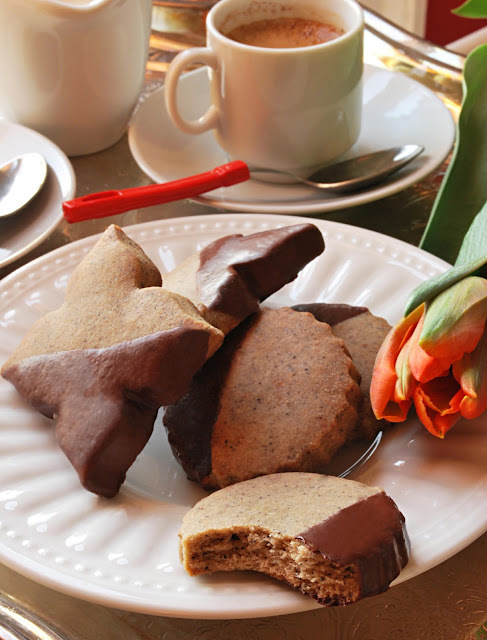 Known as the 'jewel in the crown' of Scottish baking, shortbread has been melting on tongues since the 12th Century. The 'short' in shortbread describes what the butter is doing to the gluten in the flour - its fat molecules are 'stopping it short' from developing further. Thanks to this butter-heavy union, the shortbread's characteristic crumbly texture is born. However, should the ratio of flour-to-butter be higher, the gluten would develop, resulting in a doughier texture. Typically, shortbread is made of three ingredients: butter, sugar and flour. I used to use granulated sugar, until I learned the secret to super-soft shortbread: whip the softened butter with confectioner's sugar and your shortbread will be irresistible. Ground espresso beans and a bit of vanilla extract elevate these biscuits to a whole new world of flavour (so much so that you may be tempted to put them somewhere only you know about - for indulging in a clandestine cookie break whenever the mood strikes). Flour is added to the butter/sugar mixture, and the dough is carefully mixed until everything just barely comes together. You want to treat the dough tenderly outside of the bowl as well. The dough responds to the lightest touch: a gentle encouraging from side to side with the rolling pin with a protective layer of parchment brings it to the perfect thickness to cut your desired shape. Typically, shortbread is cut out in rounds. It can also be sliced into long rectangular 'fingers,' or baked in a larger circular mould which is pre-portioned into 8 or so triangles, often with an intricate floral design. These wedges also go by the quaint name of 'petticoat tails,' which were once the height of eroticism (heaven forbid one catch a glimpse of ankle!). For these cookies, I opted for ridged rounds and a pretty four-pointed flower shape. Once the biscuits are baked, they are tenderly dipped into a waiting pool of melted 70% chocolate, which has a bit of coconut oil added to help it set and to add an attractive sheen. If it has been a while since you have bitten down onto a thick disc of buttery shortbread, you will find that when you do, everything around you goes blurry and your voice does something between a sigh and a whimper. After the seduction of the first bite, the rest of the cookie is practically inhaled due to butter lust. ... which we all know from experience are three words that can lead to all kinds of naughty. 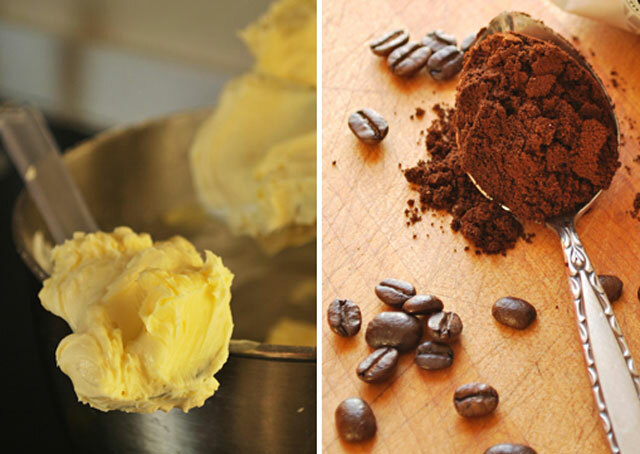 Cream together butter and sugar until light and fluffy. Add ground espresso beans and vanilla extract and mix until well combined. Add flour and salt, mixing gently until dough clumps together. Chill. Remove from refrigerator and roll between two pieces of parchment paper until 1/2" thick. 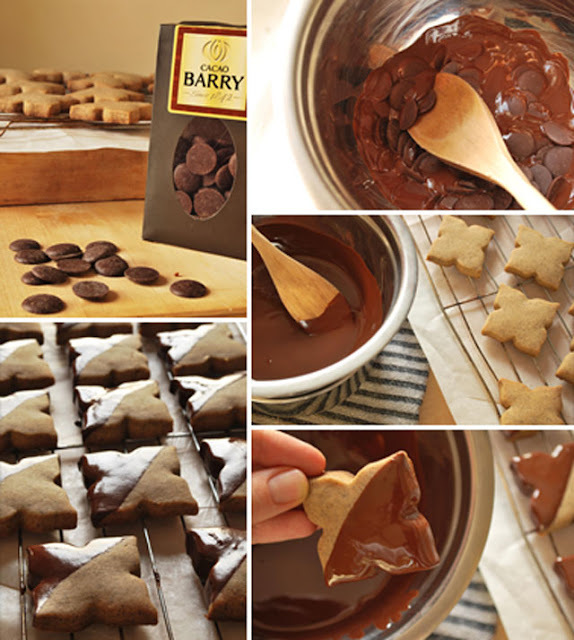 Using a cookie cutter of your choice, cut out shapes and place on parchment-lined baking sheets. Bake at 325 F for approximately 15 minutes, or until barely golden. Let cool. Place a metal or glass bowl with the chocolate pieces over simmering water. As it melts, add coconut oil and stir to combine. Dip cooled cookies into chocolate, setting on a cooling rack until set, to let any excess drip off. Great to see you there too, Akheela! I wouldn't want to just go on culinary dates with chocolate but, I want to be married to it and spend each waking moment with it. If only! 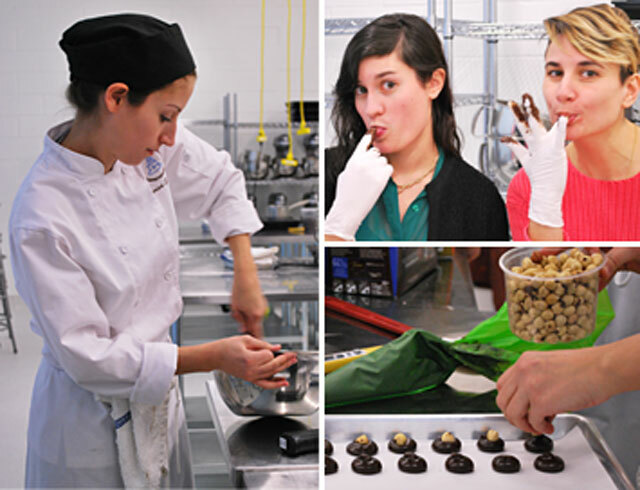 The class you guys went to sounds like so much fun...who wouldn't want to get down and dirty with chocolate? I can also see how those cookies would disappear in one sitting. Oh, why wasn't I taken to this romantic date with chocolate???!!! First, my dream is to go to Bonnie Gordon School, and secondly, Cacao Barry??? I have their chocolate pistoles at home because they are sooooo good! I get mine from The Cheese Boutique near my home. I have the 66% (I think it's Mexico) and I also have that 70% Saint Dominique with 'an exceptionally long finish'. Makes me want to get dirty in the kitchen - if you know what I mean!!!! Yes, you would love the school - it makes you feel like a professional the moment you walk in! Whyyyyyyy would I ever say no to these? It's impossible. I've tried. I had about 5 left, that I had planned on perhaps savouring with an afternoon coffee throughout the week. That first day, I didn't even turn on my machine and all five (!) had somehow 'disappeared'. Disgustingly awesome post. Also, I plan to hit the BGCCA next year for some professional development. Can't. Wait. c)The line: "In 1984, in the process of pretending to be an interesting person, I started to become one" Love that. What a great day! Those biscuits look amazing. Thank you Ira - they're among the tastiest I've ever made! I'd like to have this shortbread ready to bake off in the freezer at a moment's notice. I really think you should have a go at romance writing. Food and romance... now that is divine.